To answer that question, Michael journeys to the plain of the Yellow River, where he joins a million pilgrims at the shrine of ancient goddess Nüwa, who legend says made the first people from the yellow mud of the Yellow River. Looking for the origins of the Chinese state, he visits the excavations at Erlitou and sees an exquisite turquoise dragon sceptre from 2000 BC. China's first writing is found on 'oracle bones' dug up from the Shang royal tombs at Anyang in the 1920s. At the Beijing Planetarium, Michael travels back in time as astronomers plot the planetary conjunction that the ancients believed foretold the overthrow of the Shang Dynasty. Next, the Age of Philosophers and Confucius, whose book Analects has had greater influence worldwide than even the Bible, according to some. In Xi'an, we hear how the First Emperor united China and created the authoritarian Qin state that gave us the word China. Finally, Michael returns to the temple fair in Henan for a dramatic night ceremony to give thanks to the ancestors. 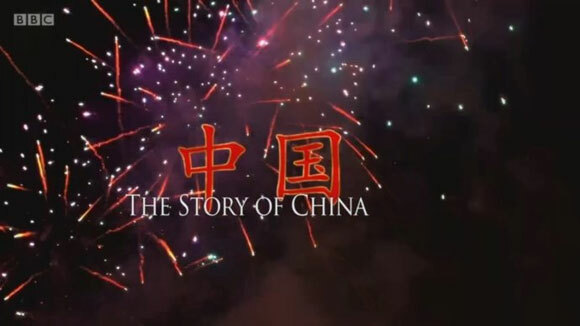 China, Michael concludes, is rising again, not just because of its economic strength, but because of the incredible solidarity of the Han Chinese view of their own civilisation, their sense of family and, of course, the presence of the ancestors. Michael Wood tells the tale of China's first great international age under the Tang Dynasty (618-907). From the picturesque old city of Luoyang, he travels along the Silk Road to the bazaars of central Asia and into India on the track of the Chinese monk who brought Buddhism back to China. This tale is still loved by the Chinese today and is brought to life by storytellers, films and shadow puppet plays. Then in the backstreets and markets of Xi'an, Michael meets descendants of the traders from central Asia and Persia who came into China on the Silk Road. He talks to Chinese Muslims in the Great Mosque and across town hears the amazing story of the first reception of Christianity in 635. Moving south, Michael sees the beginnings of China as an economic giant. On the Grand Canal, a lock built in 605 still handles 800 barges every day! The film tracks the rise of the silk industry, and the world's favourite drink- tea. Michael looks too at the spread of Chinese script, language and culture across east Asia. 'China's influence on the East was as profound as Rome on the Latin West', he says, 'and still is today'. Finally, the film tells the intense drama of the fall of the Tang. Among the eyewitnesses were China's greatest poets. In a secondary school in a dusty village, where the Chinese Shakespeare - Du Fu - is buried in the grounds, the pupils take Michael through one famous poem about loss and longing as the dynasty falls. And in that ordinary classroom, there is a sense of the amazing drama and the deep-rooted continuities of Chinese culture. This episode tells the tale of what's broadly considered China's most creative dynasty - the Song (960-1279). Michael Wood heads to the city of Kaifeng, the greatest city in the world before the 19th century. Here in Twin Dragon Alley, locals tell him the legend of the baby boys who became emperors. He explores the ideas and inventions that made the Song one of greatest eras in world culture, helped by China's most famous work of art, the Kaifeng scroll, which shows the life of the city in around 1120. A chef makes Michael a recipe from a Song cookbook, while a guide to 'how to live happy, healthy lives for old people', published in 1085 and still in print, is discussed with local women doing their morning exercises. The Song was also a great era for scientific advance in China. Michael steers a huge working replica of an astronomical clock, made by China's Leonardo da Vinci. Then at a crunch Chinese Premier League match, Michael tells us the Chinese invented football! The golden age of the northern Song ended in 1127, when invaders sacked Kaifeng, but they survived in the south. At their new capital, Hangzhou, Wood joins locals dancing by the West Lake, while in the countryside he meets Mr Xie with his records of 40 generations of ancestors. The final defeat of the Song took place in a naval battle in the estuary of the Pearl River in 1279. When all was lost, rather than surrender to the Mongols, a loyal minister jumped into the sea with the young boy emperor in his arms. 'So ended the glory of the Song', Wood concludes, 'but a new age would arise... as in China, it always has!'. The tale of one of China's most famous dynasties begins with the amazing story of Hongwu, a peasant rebel who founded one of greatest eras in Chinese history. The film takes us to his great capital Nanjing, with its 21 miles of walls, each brick stamped with the name of the village that made it. Following the trail, we go to the Bao family village and see the villagers act a Ming murder story. Like many authoritarian states, the Ming were obsessive about architecture. We see the giant fortifications of the Great Wall, the ritual enclaves of the Forbidden City in Beijing and travel with bargeman Mr Hu down the Grand Canal, China's great artery of commerce right up to the present day. We then hear about Admiral Zheng He's voyages to Africa and the Gulf decades before Columbus, watch the construction of an ocean-going wooden boat 250ft long, and hitch a ride on a replica Ming junk in the South China Sea. As state prosperity grew, so did a rising middle class. Wood looks at Ming culture in Suzhou, the 'Venice of China'. Staying in a merchant's house, he discovers the silk, ceramic and lacquer-making industries, and visits one of the most beautiful gardens in the city. Then on to Macao and the arrival of Jesuit missionary Matteo Ricci, who hoped to convert China to Christianity. In the cathedral in Beijing, we learn more about these fateful exchanges with the West. Finally in Shaoxing, we visit the house of the 'Ming Proust' and at grassroots the Zhao family in Fujian where the film ends in an elegiac mood with the fall of the Ming in 1644. China's last empire, the Qing, lasted from 1644 to 1912. It began in violence and war as the Manchus swept down from the north, but invaders became emperors, with three generations of one family ruling the country. Among them, Michael Wood argues, was China's greatest emperor - Kangxi. Under the Qing, China doubled in size to include Xinjiang in the far west, as well as Mongolia and Tibet, creating the essential shape of China today. The new dynasty tolerated a diversity of cultures and religions, including Islam. In Kaifeng, Michael visits a women's mosque with a female imam, a delightful scene that ends with laughter and selfies! The Qing also undertook huge cultural enterprises. At a traditional printing house where the wood blocks are hand-carved, we see how the Complete Tang Poems were reproduced - all 48,000 of them. We travel through the wintry countryside to a remote village where a hardy audience watch open-air opera in the snow and visit a painter's studio, and 'storytelling' houses in Yangzhou. In the 18th century, China was arguably the greatest economy in the world, and we get a fabulous sense of the rich culture that came with prosperity. But then came the clash with the British, in the first Opium War, when a British expedition destroyed the Qing navy and extracted territory and trading rights. We leave with a glimpse of the future. 'Every dynasty has risen and declined,' says Michael, 'and has needed new life to regenerate, and this time the catalyst was the British.' Among the ports China ceded was an almost uninhabited island, Hong Kong, one of today's greatest financial centres, and Shanghai, a small town then but now one of the greatest cities in world. 'Revolution', Michael Wood observes, 'has been a fact of life in Chinese history'. Between 1850 and 1950, three cataclysmic revolutions shook China to the core, but out of them, today's China emerged. The film begins in Canton with the meeting of a US missionary and a Chinese student. Inspired by the Christian story and calling himself God's second son, Hong unleashed the bloodiest war of the 19th century, the Taiping Rebellion. Wood heads into wild mountain villages in the south, where the revolution began. As imperial China weakened, foreign influence grew. Treaty ports expanded, bringing growth and wealth, trams, railways and western sensibilities. But this provoked another surge of violence, the Boxer Rebellion, an attack against the foreigners, which was crushed by those same foreigners, who extorted a huge indemnity -$60 billion in today's money. Then in 1912, the empire fell, and many groups contested China's future. In World War I, China sent 100,000 men to the western front, only to be humiliated at Versailles when German colonies in China were handed to Japan. Between the two world wars, the disparity between rich and poor, city and countryside increased. We visit Hong Kong's Peninsular Hotel in the jazz age and then follow Mao on the Long March to Yan'an, the heartland of revolution. World War II came to China two years earlier than it did in the west. Wood talks to a survivor of the Japanese massacre of Nanjing in 1937 and then charts the triumph of the communists, before ending the story with Mao's death and the boom time of the last 30 years. The series ends with the warmth of the Chinese family and, at Beijing's Altar of Heaven, a final haunting glimpse of eternal China.